In edited extracts from the reminiscences of his owner/rider, Jack Seely, we learn of the aptly named Warrior’s extraordinary exploits during the First World War. He has now been awarded the Dickin Medal, the animal Victoria Cross, for his role as a war horse. The story of my horse Warrior will show that not only did his vivid personality help me to gain the confidence of thousands of brave men, when without him I could never have achieved it, but that by his supreme courage at a critical moment, he led me forward to victory in perhaps the greatest crisis of the War. I thought from the first that we were in for a long war, but I did not think that we should be in France together for more than four years, nor did I dare to hope that we should both re-turn alive. I rode Warrior in shellfire – sometimes so heavy that he was almost the only survivor – but never once did he attempt to bolt or do any of the things which might be ex-pected of an animal reputed to be so naturally timid as the horse. No, my stout-hearted horse not only kept his own fear under control, but by his example helped beyond measure. At the First Battle of Ypres, when the British army found themselves confronted by four times their numbers of most courageous men, with an overwhelm-ing superiority of artillery gathered from all parts of their long battle line in France, then every man, from general to private soldier, and every horse, had to play his part. I did not know before that men could be so self-sacrificing and so brave. They all knew that if they failed, and the Channel ports were captured, it was all over with the Allied cause, and, perhaps, with England too. So they fought for weeks on end in blood, and mud, and misery with a spirit never equalled in the history of the British army. From there I was sent to report on the front held by the Indian contingent, and took Warrior with me. It was the wettest and gloomiest part of the line, and rifle-fire was continuous. Each side wanted to find out what the other was worth, so once again Warrior found himself exposed to that dangerous thing, rifle -and machine-gun fire. This time Warrior had not got all the ad-vantages of being “attached to General Headquarters”. On the contrary, he found himself tethered behind a little haystack into which shells and long-range bullets would thud from time to time. But he had become war-worthy. He did not flinch or tremble, though the din of battle was deafening, and when darkness fell, and I mounted him to ride round the lines, he was cool and self-possessed. To reach the front line we had to go over a ridge which should have been in full view of the enemy, but a row of trees screened one from view. It was all the more safe if we rode there, because we covered the distance in about one quarter the time, and were therefore four times more likely to come off unscathed. As winter came on we all had a harder time. It was a very wet season, the ground was soggy, trenches were filled with water, and we were constantly getting bogged. But it was, nevertheless, at this time, and in both succeeding winters on the Western Front, that we learnt that the horse is the only certain means of transport. The horse is vital to man in modern war. All mechanical contrivances fail when the mud gets deep; the horse suffers, but some survive to pull up the batteries, to bring up food and ammu-nition, to drag back the melancholy lines of ambulances. The sombre close of the Battle of the Somme was cruel to horses no less than to men. The roads were so completely broken up by alternate frost, snow and rain, that the only way to get ammunition to the forward batteries was to carry it up in panniers slung on horses. Often these poor beasts, who were led forward in long strings with three shells on each side of them, would sink deep into the mud. Sometimes, in spite of all their struggles, they could not extricate themselves, and died where they fell. Many times I accompanied these melancholy convoys with Warrior. He, too, would sometimes sink through the frozen crust into the oozing white mud below, but he was very strong, and when I jumped from his back he would somehow manage to get out. One of our troubles was that famous airman Richthofen. His observers would spot these convoys, and direct artillery fire on them, often with great effect; they would even swoop down and attack with their machine guns. On one occasion when Warrior was stuck fast a German flew down and emptied his machine-gun belt at us. Once a great shell fell near him and he was completely buried under the falling earth except for one forefoot. But with the help of a little digging we got him out unharmed except for a lameness in the off-fore. The horses suffered terribly at the Battle of Paschendaele, even more than in the Battle of the Somme a year before. But one of the finest things about the English soldier of the front line was his invariable kindness and, indeed, his gentleness at all times to the horses. I hardly ever saw a man strike a horse in anger during all the four years of war, and again and again I have seen a man risk his life, and, indeed, lose it, for the sake of his horse. The wet and the mud told upon Warrior’s health. Even his indomitable spirit began to grow weary and he had lost some of his spring. On the night of March 29 we camped at a little village called Boves near the main line from Paris to Amiens. Things looked very black. I knew that if the Germans reached the ridge covering Amiens, the French and English armies had orders to fall back, the French on Paris, the English on the Channel ports. I was woken where I was sleeping close to Warrior under a wall to hear that the German advance had continued, that they had captured the vital Moreuil Ridge, but that our infantry were holding on, much reduced in numbers. I was directed to take my brigade in that direction to help. It seemed clear that unless we recaptured the Moreuil Ridge it was all over with Amiens, and probably with the Allied cause. Sitting there on Warrior’s back I decided to attempt the apparently impossible – to recapture the Moreuil Ridge. Warrior was strangely excited, all trace of exhaustion had gone; In some strange way, he knew that the crisis in his life had come. The colonels of each of my regiments came galloping up. We consulted briefly, and orders were written for the attack. The plan was that I should cross the little river separating Castel from the Bois de Moreuil with my staff and my signal troop, and, as the brigade advanced, should go forward with the signal troop and plant my little triangular red flag at the point of the wood. Our infantry were only 400 yards from this point and were firing into the wood. It seemed clear to me that under cover of their fire I could establish the flag and headquarters at the point of the wood so that every man could see, as he passed our infantry front line, that the first phase of the battle had been won. Warrior took charge and galloped as hard as he could straight for the front line. There were about 20 of us all told when I halted for a moment and looked round to give final orders. I turned in my saddle and told my comrades that the faster we galloped the more certain we were of success, that I would tell the infantry to redouble their fire as we passed through them, and that the day was as good as ours. But I could hardly finish my sentence before Warrior again took charge. He was determined to go forward and with a great leap started off. All sensation of fear had vanished from him as he galloped on at racing speed. There was a hail of bullets from the enemy and perhaps half of us were hit, but Warrior cared for nothing. His one idea was to get at the enemy. He almost buried his head in the brushwood when we reached the point of the wood at the chosen spot. We were greeted by 20 or 30 Germans, who fired a few shots before running, doubtless thinking there were thousands of us following. 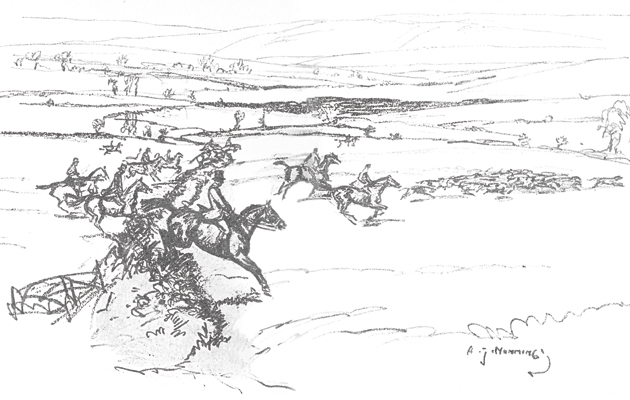 Corporal King jammed his lance with the red flag into the ground, the survivors jumped off their horses and ran into the wood with their rifles, and the first phase of the battle was over. It was an odd way to use a signal troop. When the war ended Warrior returned to the Isle of Wight. On 30 March 1922 he sailed home to victory in the Isle of Wight point-to-point on the anniversary of that great day when he had galloped through the British and German front lines to save Amiens and the Allied Cause. He had quite a gay time each winter, for not only did I go foxhunting with him whenever I had the time, but he became the family hunter. My son Patrick hunted him constantly, and often found himself near the head of the hunt, partly because he wished to be there, and partly because Warrior would not allow it to be otherwise.